Now is the time to start thinking about and planning for corn silage harvest. Preparations taken now and close attention to details like moisture content can mean higher-quality silage when you peel back the plastic months from now. One of the most important factors influencing corn silage quality is moisture content at time of harvest. Ideally, corn silage should be harvested at the moisture content appropriate for the type of silo used. Recommended moisture contents are 65-70 percent for horizontal silos, 63-68 percent for conventional tower silos, 55-60 percent for limited-oxygen silos and 65 percent for silo bags, writes Jud Heinrichs, professor of dairy science and Gregory W. Roth, Ph.D., professor of agronomy, both with Penn State. Crop dry matter yields are maximized near 65 percent moisture (Table 3) and losses during feeding, storage and harvesting are minimized. Delaying harvest can reduce both the fiber and starch digestibility as the stover gets more lignified and the overmature kernels become harder and less digestible if left unbroken after ensiling. Table 3. Corn silage yield and quality as influenced by growth stage. Silage moisture at harvest is not difficult to determine and should be monitored, if possible, to prevent harvesting of the crop outside of the desired moisture range. A commercial forage moisture tester or a microwave oven can be used to determine the moisture content fairly rapidly. If silage moisture is above ideal levels, then harvest should be delayed if possible. Corn that is ensiled extremely wet will ferment poorly and lose nutrients by seepage, which also has potential to damage the silo and if not contained, contaminate local water supplies. Silage that is too dry may result in poorly packed material, causing more mold and spoilage due to air trapped in the silage. In dry, overmature corn silage, the stover portion of the plant is less digestible and contains lower amounts of sugars and vitamin A.
Moisture content cannot be determined accurately using the kernel milkline, because of variations due to weather and hybrids. Moisture content should be measured rather than estimated. One strategy for timing corn silage harvest is to chop a sample at the full dent stage, just as the milkline appears, and determine the moisture content. Then estimate the harvest date by using a typical drydown rate of 0.50 to 0.75 percentage units per day. Harvest considerations should also focus on obtaining the correct particle size distribution and the need to process the crop. 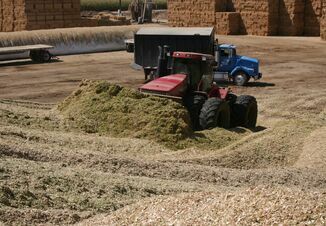 Processing silage refers to putting the chopped material between two rollers that are installed in the harvester to crush the harvested material as it passes through. Kernel processing units are becoming more popular on corn silage harvesters in Pennsylvania. Kernel processing has the advantage of crushing cob slices and kernels and can increase the starch availability by about 10 percent in the silage. The current data shows no clear nutritional advantage to processing silage unless it is overly mature with hard kernels. In some cases, this has resulted in increased milk production compared to unprocessed silage. A good general recommendation for the theoretical length of cut for processed silage is 3/4 inch with a 1-2 mm roller clearance. Figure 1. The Penn State Particle Size Separator can be used to monitor silage particle size. 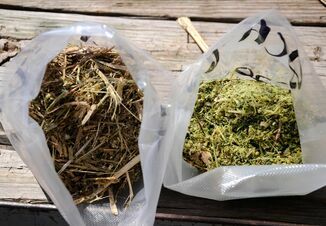 For unprocessed silage, an average theoretical length of cut should range from 3/8 to 3/4 of an inch. Particle size of corn silage should be monitored during harvesting because it can change as crop moisture content varies. The Penn State Particle Size Separator can be used to estimate the particle size distributions for harvested corn silage. Table 4. General recommendations for corn silage particle size distributions on the three sieves and bottom pan in the Penn State Particle Size Separator. Once harvesting has begun, fill the silo as rapidly as possible and continue until it is filled. Continue to evaluate processed corn throughout the harvest season. Kernels should be broken into multiple pieces and cobs should be broken into thumbnail-sized pieces or less. As the crop matures after half milkline, it may be desirable to have more kernel breakage so that much of the grain is in the bottom pan of the particle size separator. The most desirable method of packing bunker silos is the progressive wedge method, where silage is continually packed on a 30-40 percent grade. This minimizes the surface area exposed to the air that can result in DM and forage quality losses. If this is not possible, the silos should be packed by spreading relatively thin layers of silage (6 inches deep) and packing it well. 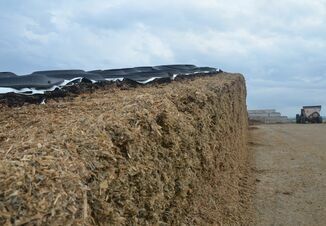 If packed well, the density of the silage should be about 14 pounds of dry matter per cubic foot. Figure 2. Technique for ensiling forage in bunker silos. Hey Buddy—Wanna Make $40 a Cow?